﻿ Yakface and Flyguy discuss the reveals from this year’s New York Toy Fair and more! 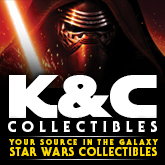 K & C Collectibles is offering FREE SHIPPING on all orders over $30 and your shipping address is within the continental USA. New: Tamashii Snowtrooper and Black Series 6″ action figure. Click the NEW PRODUCTS link under the Categories Section for a complete list of recently added items. Tamashii Nations has updated the SHFiguarts pages for their Star Wars products to include new details and images for their Princess Leia Organa (A New Hope ) figure. Click on through for the image gallery and watch for its availability in December. Yakface and Flyguy don’t have a shower scene this week, but we are back with full frontal news to talk Solo: A Star Wars Story and the latest in Star Wars collecting from Hasbro, Hot Toys, and more. Tamashii Nations continues to impress with the gorgeous and inspired Movie Realization line of figures. Check out their new Kanreichi Ashigaru Snow Trooper with cannon slated for release in September.